Decorate: Flowers, Pictures, Vases, Oh My! So this past weekend I did some decorating in my living room. My walls in my living room were completely bare. I have been purchasing things within the past couple of months to put up, but I have been procrastinating! Until now! As you can see, I’m obsessed with white. 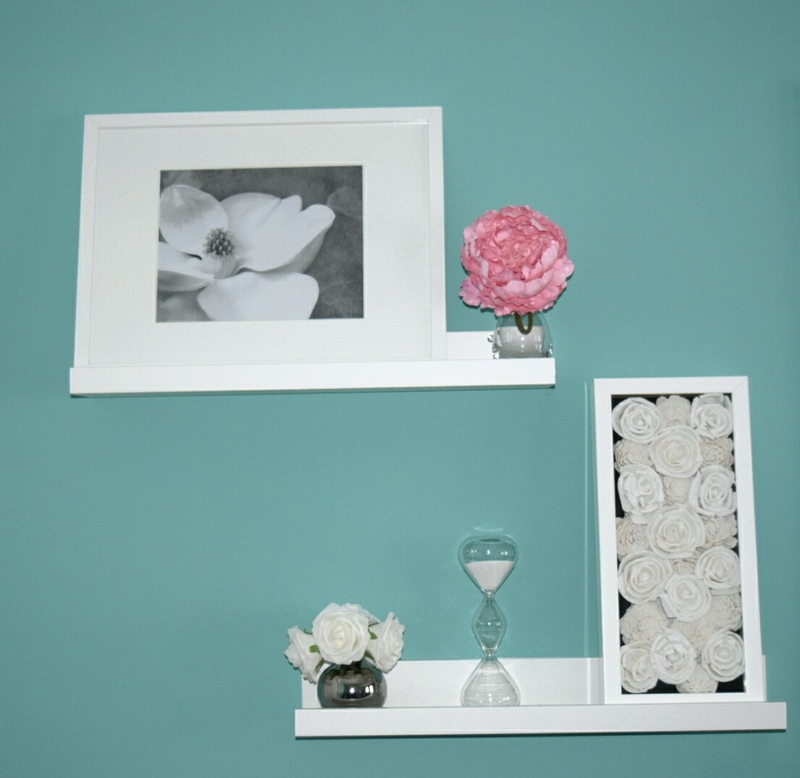 My walls are a greenish blue, and I love how clean the white picture frames and shelves look on the colored wall. I got these picture ledges at IKEA and the picture frame at IKEA. I made the shadow box with the flowers myself (I posted the tutorial previously) months ago and haven’t put it up until now. I’m also obsessed with flowers and black and white pictures. I purchased the small white roses from Amazon (they took a long time to ship, but it was well worth it- they are very lifelike) and the pink peony from Crate and Barrel. The peonies came in a bunch, but I cut the bunch up to have a single stem (I put the rest of the bunch in a vase in my bedroom). I thought the light pink from the peony was a perfect compliment to the all white display to add a subtle, pop of color. The black and white magnolia photograph is from a professional photographer that I found on Etsy. I specifically wanted a magnolia picture because my grandmother has a huge magnolia tree in her back yard, and I have some very fond memories of her and I talking on her swing and looking at the beautiful blossoms and smelling the sweet fragrance of the flowers in the air. I saw this photograph and I fell in love! It reminds me of my grandma every time I look at it! I’ve been buying, cute and funky small vases whenever I see them in the stores. They are perfect for a single stem or a bunch of smaller sized flowers, and they work great in small spaces. I got both of these vases from Crate and Barrel (the silver one is sold out). Finally, I found this hour glass at Pottery Barn on the clearance rack. I loved it and it fit perfectly on the picture ledge! I also had my hung up this picture. 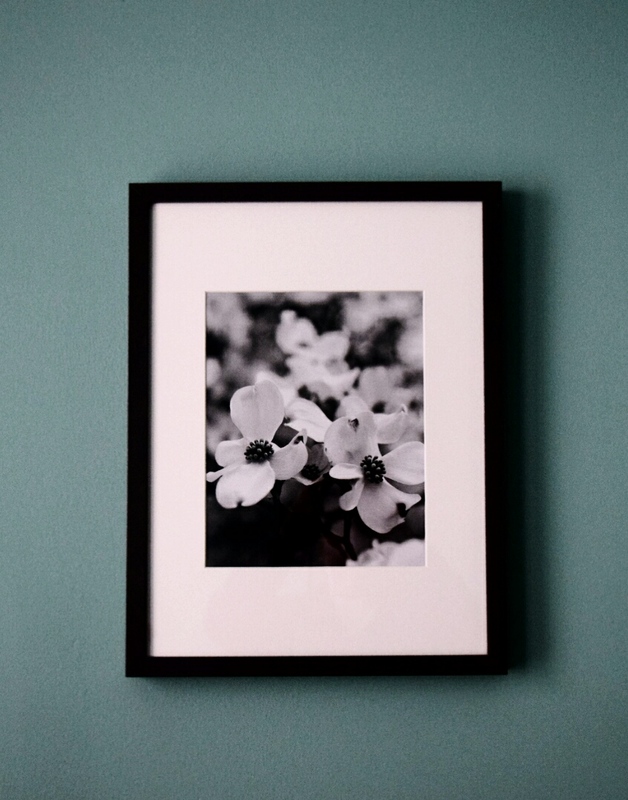 (Frame from IKEA and black and white dogwood photograph from Etsy ). love the towel shelf, great way to bring a spa feel into the home!